Your tax dollars are hard—at work. Up there on Mars, the manly god of war planet, in the red clay of the surface, our cheeky little rover is having a grand old time. Without a men’s room in the vicinity, the rover has had nowhere to peddle his artwork. 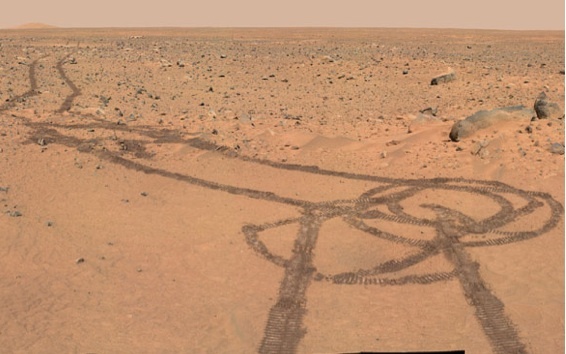 The ever-lasting image from Mars will always be what some Romans used to draw on the walls of their local bathhouse. The rover named Curiosity has a streak that transcends history. We are sure you can find similar drawings on the walls of Machu Pinchu or inside the Pyramids. Cavemen traced such images in the dark recesses of their local man cave. Now the NASA rover has followed suit. Like all great empires, the examples are bigger than all previous efforts. And, the rover’s sand drawing is more than a red castle in the sky; it is beach blanket bingo. If a kid takes a stick and traces a phallus in the sand at the beach, the tide will not wait to erase it. However, an image in the red sand of Mars will last for several hundred thousand years. We can only wait for the next asteroid to strike. Then, like an Etch-a-Sketch image, the phallus will disappear into the cosmic memory. As for now, we have a big laugh at the size of the joke.